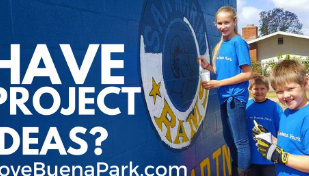 Blog: Submit Project Ideas for Love Buena Park by April 14th! Submit Project Ideas for Love Buena Park by April 14th! We're looking for Love Buena Park projects! Love Buena Park is a few short weeks away and we can't wait to see the difference we will all make together! It's time to start submitting those project ideas. You have your church, your school, your neighborhood and your neighbors in need. You know best when it comes to areas or neighbors that need a little TLC. Submit a project - submission deadline is Friday, April 14! Love Buena Park is Saturday, April 29 with Opening Festivities starting at 7:30 a.m. and Closing After Party & Free Lunch for volunteers around 12:30 p.m. at The Source- Beach & Orangethorpe.